Random thoughts about all things fiber: knitting, sewing, crocheting, cross stitch, crewel ,embroidery, and needlepoint. Alas, no room for quilting, weaving, spinning, or dyeing. I tried to think of a perfect gift for Mothers Day and decided that one of the greatest gifts you gave me was my love of reading. When I heard about the Barbara Bush Family Literacy Program, I realized that perhaps the best gift would be to pass it down. I hope it will bring joy to your day, knowing that the gift donated in your name will allow a young mother to become a better reader and be able to share the gift with her children. LIttle Golden Books and One Fish, Two Fish started my journey and I still think that Dr. Suess did it right. I remember bringing my book to your bed , sitting up against that padded headboard, and reading Little House on the Prairie while you read your Erle Stanley Gardner mysteries. You took me to the library constantly, always patient while I looked through the Black Stallion books and dreamed about visiting Misty on Chincoteague Island. You told the librarian, that, yes, this little girl really will read all of these books this week, so please let her check out more than allowed. There's a lesson right there! Ask and you might get the answer you seek! Mom, you taught me that reading the instructions on the sewing pattern for the Barbie dress would likely help things turn out right. This led to pride in a job well done, not to mention several prom dresses and matching Hawaiian shirts for me and my high school boyfriend. As a young mother, I even earned money with a needle and thread, allowing me to stay home longer with Danny. With the power of reading, I tackled the words of crochet and knitting, and deciphered color coded charts for needlepoint. I used the nuances of language and word choice to develop my own color palette, no simple reds and blues for me, thank you! Instead a profusion of ochres and azures and vermillions and sapphires! A lifelong fiber fascination and celebration resulted. I never learned to speak a foreign language well, just a little TexMex, but I learned to read several 'languages.' You showed me how to cook from a recipe and I dove into some crazy foods with complicated instructions. Throw in a little math and you can make twice as much or half as little. I learned to read music and calculus, even accounting. And reading between the lines fueled my natural skepticism. No reading is too difficult, so legal documents, student rules, and OpEds only make me more knowledgeable. Reading is so powerful, Mom. I married a man who loves to read and we raised a son with a book in his hands. The joy continues. On this, your special day, please know that I love you and that all of my successes lead back to you. I can never repay the gift you gave me, but I hope to pass it on. Since my last post, I've been really busy with my goats and in preparing my house for sale. My crafty hands don't like that at all! However, I was able to complete a baby afghan for a young mom in West Texas. I wanted to display it as I was crocheting it, but didn't want her to suspect it would be hers! Granny squares are sooooo soothing. But the time has come to de-stash my life. I know, I know, but this time I mean it! We plan to put our house up for sale in early May, so the clock is ticking! Of course, when I went in the sewing room, I found a stack of jeans that needed repair on top of the sewing cabinet. Rather than jump into the de-stash (stall warning), I decided to repair the jeans first. Working on the ranch can really mess up your jeans with barbed wire and such. Farm clothes get dirty and torn, kinda like 'play clothes' from when I was a kid. Fix the holes, patch the tears, and, voila!, another pair of jeans rejoins the queue. Like most sewing skills, mending has some tricks that ensure a strong, lasting repair. Ah, denim blue. Here's a quick tutorial. First, stabilize the tear with stay-stitiching. Just a quick straight stitch around the edges prevents further raveling or stretching out of shape. Trim excess fraying and raveling. However, on work clothes, I leave the warp or woof threads that are still connected at both ends; I only trim the broken ones. Determine whether to patch and darn from the back, or place a patch on the outside. If the tear is new and the edges meet up reasonably well, I prefer to patch from the back as it generally is less obvious and a lighter weight backing material can be used. Baste the patch in place. Next, I use a multi-stitch zig zag stitch to 'darn' the tears and secure them to the backing fabric. On this repair, I inserted a line of stitching diagonal to the patch to provide strength along the grain of the fabric. With a top patch, I use similar fabric to cut a patch, making sure its edges will sew into fabric that is not weak. Be sure to match the grain lengthwise to avoid the patch stretching out of shape. In this case, with a patch near the knee, I did a satin stitch edge to secure the edges of the patch from fraying or coming loose. Wow. I forgot about these jeans! A piece of metal tore a humongous hole in those jeans (and me, too!). That's it! Four pairs of jeans returned to service! Well worth a half hour of time. One pair was sent to recycle heaven: those jeans were ripped in the crotch and the fabric was nearly worn through. I would have needed to replace the entire seat. Ain't nobody got time for that! Ah. Back to de-stashing. 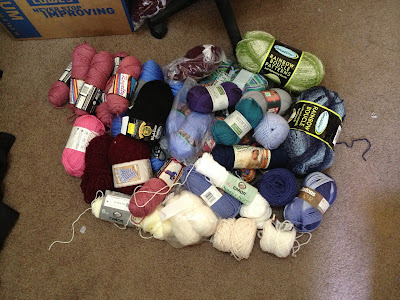 I did a quick sort of random yarns, and pulled out odd skeins and weights and made a pile. I offered it free to friends on facebook and got multiple offers in a few minutes. There's some yarn gone! I also packed up all of my sewing patterns (which is a lot after 40+ years). One box done! Also from my hands--- food! It's been a while since I was in a fiber state of mind. My hands have not been crafting due to RA stiffness and to my being consumed by El Rancho and all its inhabitants. However, I picked up my hook again and am nearly done with square #4 of the tablecloth mentioned in the last post. On the way to visit the family in Marble Falls, I seemed to pick up the rhythm like I had never left. But even when I don't craft with fiber, I am still using my hands productively-- to make food --- which has fiber! I enjoy cooking when I have (or make) the time. When I was at Goat Camp in October as a sous chef (see Goat Camp Part II) , I reconnected with my foodie self. I've always known what a powerful drug food can be and now I am striving to make better food choices. Rather than delve into a biology lesson, I'll move onto what I've been doing in the kitchen. First, I'm trying to cook my food. From scratch. I've always been a pretty good cook, but I'm trying to make meals that I can name all the ingredients and where they came from. Eat real food! For instance, tonight we are having Swiss Steak with braised cabbage and mashed potatoes. No mixes, kits, or boxes here. I am a CrockPot fiend, so I've had two of them going most of the day. Sure, I have to chop and sear and saute and such, but there are not hidden junky things in the pot. Just food. Yum. I am also trying to rebuild my personal microbiome by ingesting good bacteria and getting rid of the bad ones. Most folks will think of yogurt immediately as a food having good bacteria, but many fail to realize that you need to be eating whole milk yogurt without the sugars and fruits put in there by someone else. Or better yet-- make your own! Add your own fruit and avoid the preservatives and colors and 'natural' flavors! But there are billions of bugs that we need. Another way to rebuild your gut is to eat fermented foods, such as sauerkraut. So I started researching fermented foods and made some! So far, I have made apple-cranberry chutney (added cranberries, used cinnamon and nutmeg for spices), lemon confit, sauerkraut, and ginger spice carrot sticks (I did not use coriander). I did the apples first and have already moved them to the fridge and have begun eating them. The others were made yesterday and today and need to sit at room temp at least a week. The foods are not rotting because they are preserved by salt-- nature's first food preservative. Anaerobic bacteria are munching away in the brine, converting the fruits and veggies into pickles! Once the flavor is where you want it, you pop it in the fridge. (You can also do a pressure canning, but that kills the microbes). Finally, something I learned about myself 20 years ago was that simple sugars and starches are not good for me. Whether you are talking Atkins, Weston Price, Dr Mercola, or a paleo dietician, all note the same thing (using different reasons and language). I lived a low(er) carb life until about 10 years ago and have decided to return to my whole food lifestyle-- this time with microbes! What a week! I've been at the PreLaw Advisors National Conference in DC all week and it's been a whirlwind event with events day and night. You'd think I wouldn't have had time to crochet, but I did! 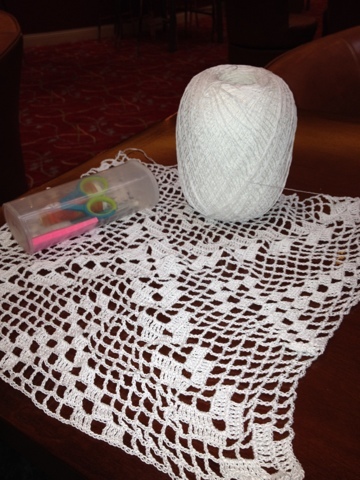 I ended up choosing the perfect project in my filet crochet tablecloth. It's small with an easily memorizable pattern--- really just a bunch of ch and tr. The only hard part is putting two tr in the 4th ch in the corners. The best part about this project has been that the more I do, the smaller the jumbo ball of #10 crochet thread! Our conference involved bus rides nearly every day, and traffic in DC is a bear, so I would get 45 minutes a day minimum of hooking on the bus. I am member of the board and was totally consumed the first two days, but after that I attended sessions and luncheons and could hook on the side. I even worked on my project during movie night because we weren't in pitch darkness. Another thing I did was create a new way to carry my tools. I took a Crystal Light container and removed the label. Into that I was able to place two hooks, a small pair of scissors (TSA approved), post-it notes, a pencil, needle threader, and tapestry needle (for weaving ends). 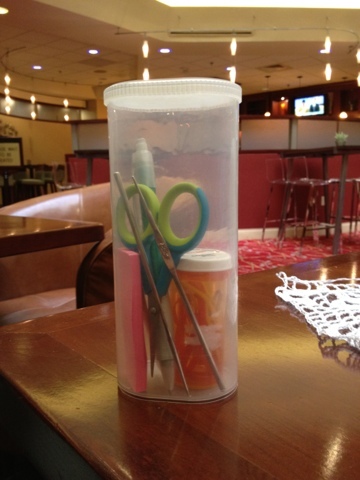 To keep the small items from falling out and getting lost, I took a prescription container (label removed) to hold them and put them in the taller container. Overall, this has been the best setup I've done so far. The crystal light container is see-through and the top snaps on firmly, so no accidental opening. Overall, I completed one-and-a-half squares for the table cloth. I'll need a minimum of nine squares for the tablecloth, so hopefully this means this will not be a perpetual UFO. Getting ready to board my flight to Houston! Starting square number three once on board. I hope to get several "rounds of the square" done before I make it back to Texas. We’ve Moved! - Join us at the new and improved Bernat Blog at http://blog.bernat.com/!